Home Capitalism Profit maximization is moral! In the last class of my MBA business ethics course, a student commented that while he agreed that businesses must pursue profits to survive, he couldn’t endorse outright profit maximization. Had he been reading my book (the assigned textbook for the course), it should have been eminently clear that there is no virtue in restraining the pursuit of profit: profit maximization is moral. It is, of course, discouraging that businesspeople (all the students in my course work full time) don’t grasp that truth, because that hurts not only their companies but everyone else as well. …there is no virtue in restraining the pursuit of profit: profit maximization is moral. Profit maximization is an important overall goal that drives everything that a business does while producing and trading material values: investment in productivity enhancing technology and employee training and motivation and a relentless pursuit of innovation to develop new products and services and to increase the quality of the existing ones while lowering costs. Such actions to maximize long-term profits of course benefit the company itself—its shareholders—in terms of increased share value, dividends, and investment in future productivity and profitability. But such value creation for the shareholders can only be achieved by creating value for customers: new products and services, higher quality, and lower prices. And value for customers can only be created by productive, motivated, and fairly compensated employees, with the help of reliable suppliers who also pursue profit maximization and therefore want to trade value for value. Such a situation is a win-win for all parties, as opposed to trying to artificially restrict profit maximization. As an example, consider the energy market in Ontario, Canada’s largest province. In a recent Financial Post column, Lawrence Solomon presents an interesting case study, comparing the government-owned electricity monopoly with privately owned—profit maximizing—natural gas companies. As Solomon explains it, “the electricity companies are run by promise-them-anything governments whose political leaders are focused on getting re-elected.” Instead of focusing on the bottom line and aiming to maximize profits, these companies are trying to maximize the government’s chances of re-election. Solomon describes the devastating consequences of more than a century of public ownership of the electricity sector in Ontario, from the bankruptcy of Ontario Hydro and the loss of Ontario’s Triple-A credit rating in the 1990s to the tripling of Ontarians’ electricity bills today (which makes the power costs in the province among the highest in North America). The latter is the consequence of the provincial government shuttering the efficient coal plants and subsidizing ‘renewable’—unreliable—wind energy in a crusade against global warming, by paying up to 20 times the market rate to its producers. No wonder Ontario taxpayers and households are struggling with the electricity subsidies and costs, and companies and new investment are chased away to less expensive electricity jurisdictions. Meanwhile, the profit-maximizing, privately owned natural gas companies, competing against each other in a (relatively) free market and being held accountable to their shareholders, provide energy to their customers at market price. This is the price at which the supply and demand meet, providing the producers the highest possible profit and the consumers the lowest possible price. With examples like the electricity versus natural gas production and trade in Ontario, everybody should be able to see the benefits of businesses seeking to maximize profits in competitive, free markets. So why did the student still, at the end of the course, feel apprehensive about unrestricted profit-maximization? Because he, like many others (who don’t have the benefit of my course), have not understood that profit maximization—like any pursuit of self-interest—cannot involve exploiting others. Peter Schwartz eloquently explains in his Huffington Post article (also required reading in my course) and his book, In Defense of Selfishness, that this is due to people confusing rational self-interest with the irrational preying on others. They consider Attila the Hun and Bernie Madoff the same as great thinkers and producers, such as Thomas Edison and Steve Jobs, who don’t exploit others but trade with them instead, exchanging value for value for mutual benefit. Only grasping the difference between irrational exploitation and rational pursuit of self-interest makes it possible to embrace profit maximization as the overarching goal of business, which creates win-win, life-enhancing outcomes for all parties, from the shareholders and suppliers to customers and employees. 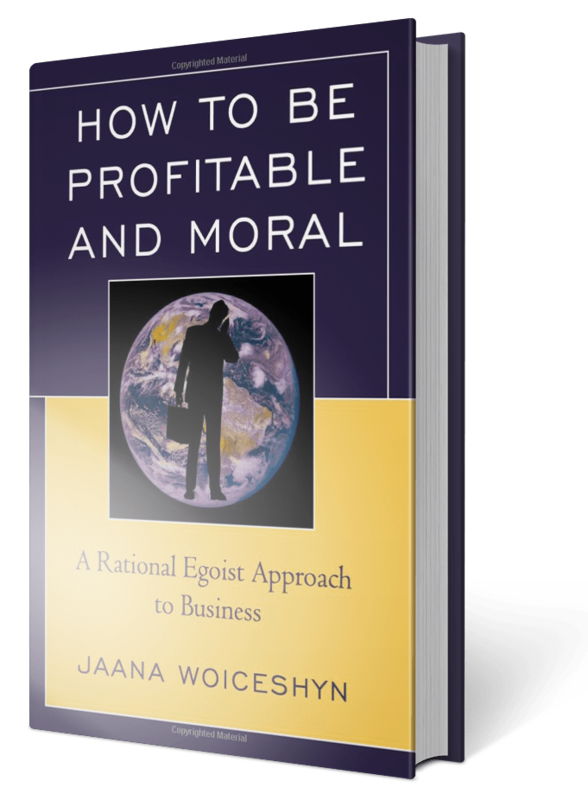 Profit maximization makes human flourishing possible, and therefore, it is moral. Excellent point about a false equation of thieves with producers. I think your students had an underlying belief in unfairness, or were simply envious. Aversion to profit usually comes from those beliefs, which are rooted in teachings of fixed-pie economics and drive-to-the-bottom ethics – common in our society.